Way back in the dark days (that time before the internet) kids were only told to "go outside and play". And they did. I remember those days. I grew up in the days when we all had to take typing class in highschool not keyboarding. Kids had to find other ways to entertain themselves without video games or DVD players or iPods. But they didn't know they were missing all that technology so we blissfully went outside and thought up things to do. On occasion that would mean getting involved with a little mischief. One thing that kids liked to do (I never did this but I heard about kids who did) was to find a really funny street name and drive there late at night and nab the street sign. A trophy of sorts. According the wikipedia "Street sign theft occurs when street signs are stolen". This statement is funnier than the football announcer who says "If the other team wants to win this game they're going to have to score more points". Street sign theft is just a bad idea. But it's still fun to have your own street signs. With the holidays coming up I was thinking about different fun gift ideas when my friends at blogsvertise sent me the link to this really fun site. SafetySign.com. 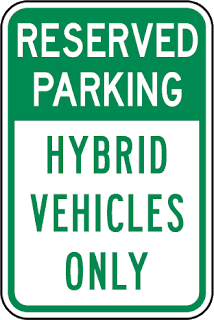 My folks just got a Prius and so I was thinking about getting them a special sign for their garage where they park and plug in at night. That could be fun. SafetySigns.com has all kinds of unique parking and safety signs and the supplies needed to post these signs too. I am pretty sure you can't take it upon yourself to post traffic signs in your neighborhood without the blessings of your local Planning/Zoning and City Council but you can post any of these in your house or in your garage just for fun. The other cool thing you can do is to customize any of these signs. You can create your own road sign with your own unique name. Does it matter that that street doesn't actually exist? No. Not really. But it would be a fun addition to a game room, family room, or back porch. Yes, now you can go on your Mary Way. Or you can customize it to say whatever you want. It's sort of fun. The other signs I like are the golf cart parking - what else do you get the golfer that has everything? And you can get a sign for your new driver just to make sure your teen knows where to park the car and at what time of night that car should be parked. Other fun signs might be a sign for a teenage boys room "hard hat area" or other safety sign. Right now my son just has the bright yellow caution tape across his bedroom door - basically telling us all to enter at our risk. There are all kinds of fun signs you can find at SafetySign.com. So remember, just like digital downloads, get your signs like you get your music - the legal way. Buy them. That is my PSA for the day. This post was ever so slightly sponsored but as always my ideas, enthusiasm, and opinions are my own.